The RNIB withdrew support for the tactile MOON alphabet, some years ago. However it still has use for the vast majority of blind people, who lose their sight later in life and who never learn Braille. It can take years to become truly adept at Braille but this is an essential task, for any blind person involded in academia or who has a serious interest in literature; as there is such a great wealth of material in that format. 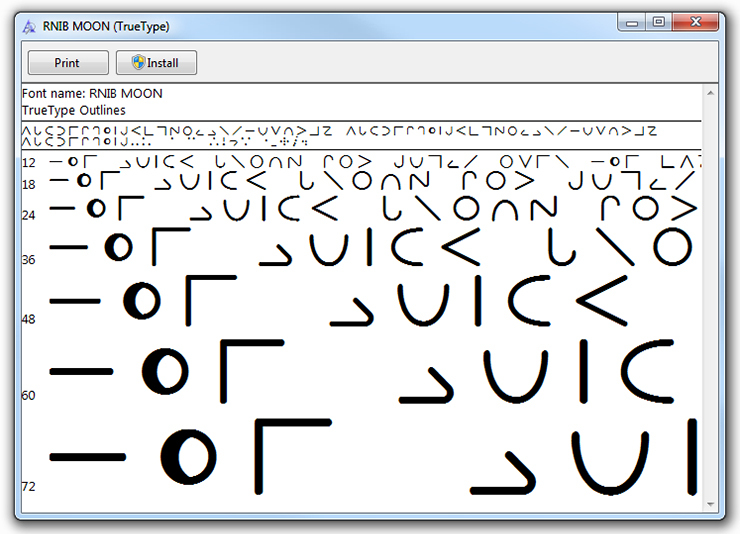 MOON is simply too large for it to be practical to transcribe sunstantial amounts of text into it. For this and other reasons to do with costs, it could never be considered a true alternative to Braille. However those who have visual memory of the Latin alphabet can learn MOON quite rapidly; sometimes in a matter of minutes. It is also suitable for some blind people with learning difficulties. This makes MOON ideal for important but small pieces of text, such as labels and signage. The RNIB MOON font that was downloadable from the RNIB's website had several small geometric errors in it, which made it unusable for some kinds of tactile printers. The download below is a fully functioning version, that I corrected.